-Offers guidance on creating a beauty and self-care regime that is catered specifically to you. Filled with inspirational images and a message that's sustainable for a lifetime, Slow Beauty will help harness the power that’s within every woman to physically, mentally, and spiritually nourish their body from the inside out. "With great wisdom, warmth and insight, Shel Pink shows us how to slow the pace and quicken our joie de vivre with this thoughtful road map to beauty and well-being." Shel Pink is a true beauty pioneer: In a time of quick-fix solutions, she approaches beauty from the inside out in a manner that is not mere lip service. Her truly unique approach to beauty encompasses the mental and spiritual changes we can all make so that we feel better, which is ultimately reflected in the way we look. In Slow Beauty, Shel offers journaling exercises, recipes, and stories meant to enlighten, inspire, and promote personal growth. It is not vanity for vanity's sake, it's wellness for beauty's sake. Read it and reap." I love this book. I love the title of this book - it made me take a deep breath before turning the first page. Life has become a rush: a quest for short-cuts and quick fixes. How refreshing, and inspiring, to learn more about nourishing from the inside out. Not just in the sense of your skin, but also your mind, your organs, your body as a whole. We all know one or two women who seem to glow from the inside, and take life at their own pace. I've always wanted to be one of those women! Slow Beauty is a detailed, practical, enlightening guide to that place - no matter who you are. Shel Pink’s Slow Beauty takes us on a fantastic journey. I love the emphasis on self-care, rituals, and connecting back to our authentic and unique beauty through the ultimate beauty practice: meditation. "An enchanting storyteller and a powerful proponent of the Slow Beauty movement, Shel Pink has created an engaging, inspiring, and thought-provoking guide designed to help us all slow down, relax, contemplate what is important, and integrate meaningful change into our lives. I’ve long been inspired by her vision and personal outlook, and it’s wonderful to have discovered them both so beautifully communicated in this lovely new book. I encourage you to rush out to get it and then slow down to enjoy it to its fullest." "Wellness and self-care are at the core of Shel's Slow Beauty reminding and teaching us to put into practice the familiar expression beauty comes from within. Her joyful and inspiring tone make the four pillars of her practice so easy to grasp and work into our daily lives. This is the type of beauty you can't put a label on and one that fits every single body out there. It's the kind of beauty that matters and Shel is here to help guide us along the path of realizing it." "This is honestly the most beautiful book I have ever seen! Slow Beauty is the art of turning self care into a self love meditation. 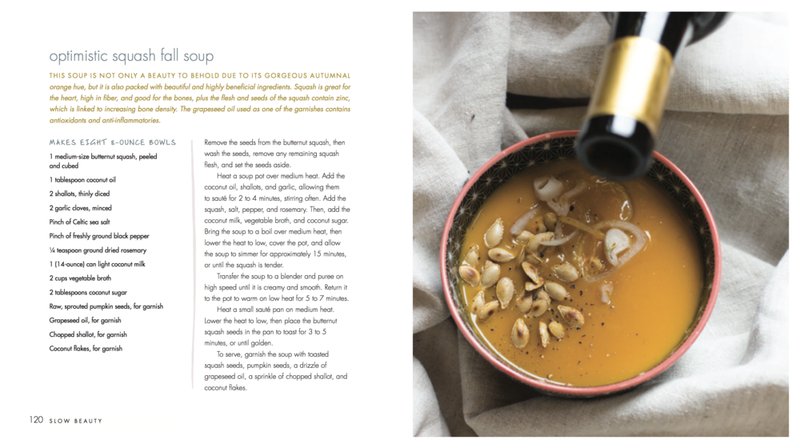 This book is filled with the most beautiful recipes to nourish your mind, body and soul and you will want to try every one. Shel redefines what it means to slow down and shows you how to savor and beautify everyday moments. You will want to read it over and over again. " "Shel Pink is the living embodiment of beauty. Far from selling us another quick fix, her philosophy of Slow Beauty is built on the foundation of loving yourself from the inside out. Her mindful beauty rituals and recipes are nourishment for your body, mind and soul."